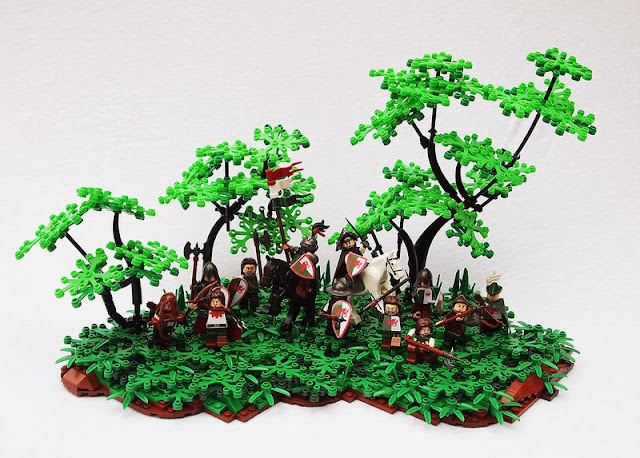 Mark Erickson a.k.a Mark of Falworth shared his entry to the custom faction category of this years Classic Castle Contest after his real life brother Brother Steven. Mark's custom faction is the Welsh Warband. Although there is nothing extraordinary with custom stickers on shields and torsos they look realistic and in simple LEGO style. Honestly the stickers could be printed in better quality. He also used third party accessories as well. Everything aside posing of the minifigures in the creation is really impressive. I especially like the posing of the halberdier on his knees on the right.